Dan Wells introduced us to John Wayne Cleaver in the chilling novels I Am Not a Serial Killer and Mr. Monster. In I Don't Want to Kill You, Cleaver faces his toughest challenge yet.John Wayne Cleaver has called a demon---literally called it on the phone---and challenged it to a fight. He’s faced two monsters already, barely escaping with his life, and now he’s done running; he’s taking the fight to them. As he wades through the town’s darkest secrets, searching for any sign of who the demon might be, one thing becomes all too clear: in a game of cat and mouse with a supernatural killer, you are always the mouse.In I Am Not a Serial Killer we watched a budding sociopath break every rule he had to save his town from evil. In Mr. Monster we held our breath as he fought madly with himself, struggling to stay in control. Now John Wayne Cleaver has mastered his twisted talents and embraced his role as a killer of killers. I Don't Want to Kill You brings his story to a thundering climax of suspicion, mayhem, and death.It’s time to punish the guilty.And in a town full of secrets, everyone is guilty of something. 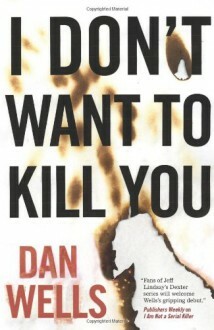 I find serial killer books soothing.